August 2015 marked the 90th anniversary of one of the few unsolved murders committed in Wauwatosa, Wis. (a suburb of Milwaukee), the killing of 8-year-old Arthur “Buddy” Schumacher Jr., son of a pharmaceutical supply salesman and grandson of one of the city’s key leaders in the early 20th century. He was reportedly last seen by three friends after they hopped off a freight they’d jumped to get a ride to a nearby swimming hole. For seven weeks, the community and state searched desperately to find the boy before his body was found just a mile from his house with his clothing torn and a handkerchief shoved down his throat. It wasn’t long before police had what they thought was a sure case against a man who was living in a “hobo camp” near where the boy went missing. However, they were forced to let him go after witnesses changed their minds about key pieces of evidence against him. Later, a man who was serving a life sentence in Minnesota for the killing of a young St. Paul boy, confessed to killing Buddy Schumacher. This man was never charged with the crime either. And neither was another man who confessed to the murder. Nobody has ever stood trial for killing Buddy Schumacher. 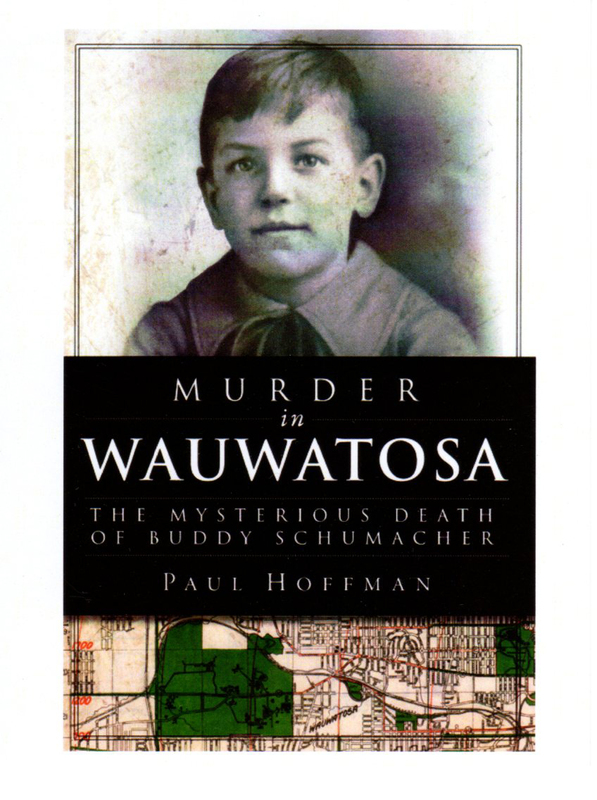 I’ve written a book, “Murder in Wauwatosa: The Mysterious Death of Buddy Schumacher,” that was published by The History Press in June 2012. The book discusses the reasons nobody was ever charged with the crime, as well as the main suspects, the Schumacher family and other key people involved in the investigation. But it is much more than just a book about a murder. The book also touches on subjects such as the state of mental health care during that time, homelessness, Prohibition and the forensic tools investigators had available to them. I also write about the good things that came out of such a horrible tragedy and what became of the main characters involved in the case, while also raising several questions that have never been answered.